Game-makers like Peter Molyneux, Ken Levine and David Jaffe talk about their favorite games this year. This time of year is always replete with top ten lists and Best of Year selections. The Escapist staff each picked our five favorite games of 2011, and we'll soon put forth our nominees for the official Game of the Year. Journalists are always debating the relative strength of games, that's nothing new, but there's another group of experts out there that don't always get to nominate their favorite game - the people who make them. Thankfully, Eurogamer was nice enough to ping a few prominent developers and ask them point blank: What was your favorite game this year? As you can guess, the list is populated with games that will soon be known as classics. First off, Ken Levine from Irrational Games took a break from making BioShock Infinite to take several arrows to the knee. "The game that's really taken over my life is Skyrim," he said. "It's an incredible achievement in world creation and an inspiring product with an insanely awesome amount of content that feels terrific. I applaud those guys." To Levine, the breadth of the experience is really amazing. "If I had pitched to somebody, we're going to make this experience, and you can spend hours if you want just walking around catching butterflies, people would tell me I was crazy." Two elder statesmen in game design - Richard Garriott (Ultima series) and Peter Molyneux (Populous, Fable) - both fell in love with Minecraft this year. "At the start of the year the game was rough and ready but with a purity which showed amazing potential," said Molyneux. "Now here we are at the end of the year and Minecraft is stuffed full of features, achievements, discoverable mines and villages and even an endgame." Said Garriott of Minecraft: "This sandbox game is one I love to play, wish I made, and will inspire my future work!" Dark Souls also got a few nods for its punishing difficulty. "You might not like it at first but Stockholm Syndrome kicks in and you'll find yourself heavily addicted, craving it every waking hour and talking feverishly in low tones to your friend," said Dylan Cuthbert from Q-Games, makers of the PixelJunk games. "I loved it - loved the systems, loved the weird Japanese flavour. It plays like first edition Dungeons & Dragons through a Japanese lens. The art is crazy, the monster design is weird - but also familiar because it is very D&D. Frustrating as all hell though," said Brad Muir from Double Fine. 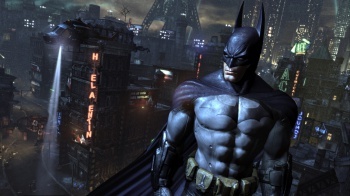 David Jaffe, he of Twisted Metal and God of War fame, had troubled narrowing down his list but went with Batman: Arkham City. "What I love about Darksiders and Zelda and this new Batman is that they're sandbox enough that it makes me feel immersed in the space but it leads me enough and it's constricted enough that I still feel like I'm being taken by the hand and being shown something cool frequently enough that I don't end up getting lost."